My domestic helper is not around. She has brought my younger boy to Popular to get his Geronimo Stilton books. I have no idea what to cook and didn't feel like buying from outside. Finally decided to just fry a simple tung hong for dinner. This is a really simple dish and you can add whatever ingredients you have in the fridge or fancy. This is my version. Method: Heat some oil in a wok. Scramble eggs till foamy and then add in chopped garlic. Fry for a while then add in carrot, french beans, mushroom and prawns. Cook for a minute or so. Add in tung hoon and pour sauce over it. Fry the tung hoon and let it soak up the sauce. If tang hoon gets too dry, you can add more chicken stock. Fry until the sauce is almost dried up. Sprinkle some crushed black pepper and mix well. Transfer to a serving dish, and you can sprinkle with some fried shallots and coriander leaves if you like before serving. I love tang hoon. Any leftover? Thanks for the simple recipe. Going to try it out! And see that you have managed to link your fave blogs to your own now. Congrats! Joyce, this fried tung hoon is very nice, you must give it a try. Thanks to Sharon of NK, she helped me to do that. 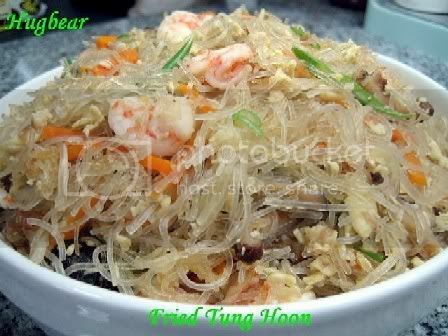 That looks simply yummylicious.. must try one day .. my dds love tang hoon! Hey, Pauline, thanks for dropping by. Yes, this is a really yummy yet simple recipe. Go and try it. Glad it turned out good for you. Yes, you can just omit the fish sauce and maybe increase the amount of light soya sauce to taste. Hi Steph, try them and let me know if you like all of them. Why are you home alone for 2 months? I have your fried tung hoon. My mum found it too bland but to me is ok.
Maybe for your mom's plate you can add a little more fish sauce for her. To me, I find this just nice too. shouldnt the tung hoon be soaked first? Yes the dried tung hoon must be soaked first before use. Just like what we will do to bee hoon. Hi! Was looking for fried tung hoon recipe and came across urs and this http://yewyen.vox.com/library/photo/6a0100a7f6f29c000e01101673f3e1860d.html. Looks like the second one has exactly your recipe. U might want to check it out. Thanks for the recipe. Will be trying it for lunch! What you can do is fry garlic, onion first. Then add other ingredients like prawns, fish cake, etc. Then add either plain water or chicken stock and seasoning to your stock. If you like the tang hoon to look brown, add some dark soya sauce and do a taste test. If taste is ok, add the soaked tang hoon. Let the tang hoon soak up the sauce for a while before stirring and mixing it well. In this way, you will not have lumps of tang hoon or tang hoon sticking to the bottom of your wok.